I-70 exit 202 to Rt. 800 N, at Marina Rd. One mile northeast of Smyrna. Marina is near the tri-county corner. The 2,270 acre lake, with a shoreline of 38 miles, is administered by the Muskingum Watershed Conservancy District (MWCD). The dam was constructed by the U.S. Army Corps of Engineers for flood control. 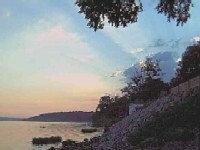 The lake is in the Muskingum Watershed Conservancy District�s chain of lakes and all boating, swimming, camping, and picnicking is under MWCD control. The Division of Wildlife annually leases public fishing and hunting rights on MWCD lakes and lands. Piedmont Lake was impounded by a dam across Stillwater Creek and is kept at a conservation pool level of 2,270 acres (elevation 913.0 feet), except in times of extreme flooding. The lake reached conservation pool in March 1942. It attained a maximum depth of 38 feet with a mean depth of 14.9 feet. The lake is approximately 10 miles long. Piedmont Lake is considered by many to be the most scenic of all the MWCD lakes. It is set in rough, hilly, unglaciated terrain, most of which is heavily wooded. Few buildings are visible throughout its entire length. Public Fishing Areas in Southeast Ohio -- including Belmont, Guernsey, and Coshocton Counties and counties to the south of them. The Bowerston Section of the statewide Buckeye Trail passes within six miles of Stratton House, where it skirts the northwest side of Piedmont Lake. Take a short trip through Holloway to Route 22, and you're there. Following it in either direction will be a beautiful experience.